I’ve been posting a lot of meat dishes lately, writing about meat, even declaring my love of meat in my last post. That said, I’m taking a break from meat. This is simple and delicious vegetarian dish (if you use vegetable stock), and served with steamed rice, is a meal in and of itself. 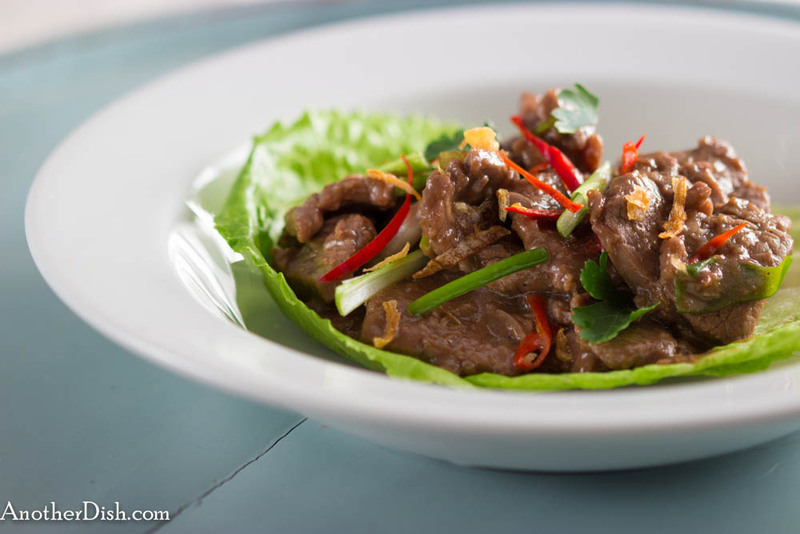 It’s not too spicy (depending on the chili garnish you use), give it a try tonight! Drain tofu block and cut into 1-inch cubes. Place cubes in between paper towels and let drain further for about 15 minutes. 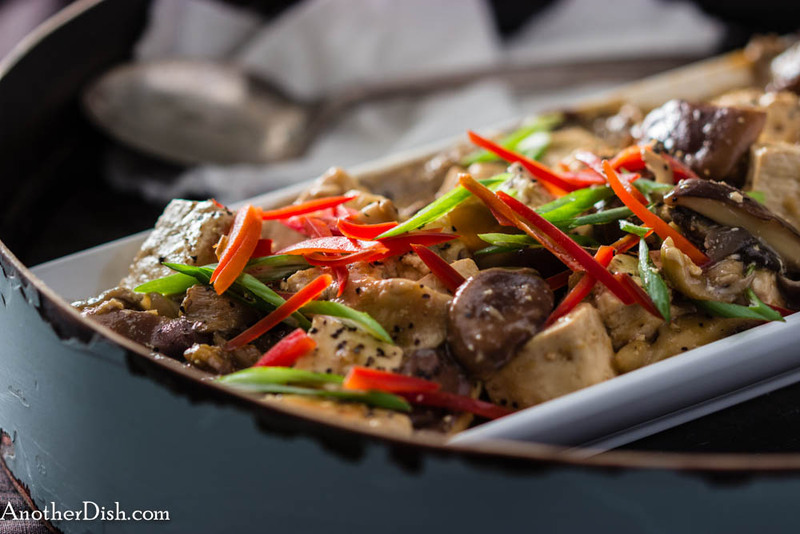 Place tofu in a shallow dish. Whisk together sesame oil, 2 tsp soy sauce, ground black pepper and ginger in a small bowl. Add to tofu and toss until tofu is well-coated. Cover with plastic wrap and let marinate for 30 minutes. Whisk together stock, 2 Tbsp soy sauce, cornstarch and sugar in a small bowl. Heat oil in a wok over medium-high heat. Add the garlic and stir-fry for 30 seconds. Add the mushrooms and stir-fry for 4 minutes. Add the cornstarch mixture and tofu, and gently mix for 1 to 2 minutes. Season with a couple additional sprinkles of soy sauce, if desired. Remove from heat and place on a serving platter. Garnish with the sliced green onions and red pepper (add more red pepper, if desired). Serve with steamed jasmine rice. Serves 2 as a main dish, or 4 as part of a Thai meal with other dishes. This entry was posted in Main Dishes, Thai, Tofu, Vegetables, Vegetarian and tagged Chilies, Cooking, Food, Food Photography, Foodie, Jasmine Rice, Recipes, Southeast Asian Food, Spicy, Thai, Thai Food, Vegetarian on January 13, 2014 by AnotherDish. Here’s another simple, quick and delicious stir-fry dish. The garlic, liquids and sugar cook down into a wonderful, sweet and sticky sauce that nicely compliments the pork tenderloin. 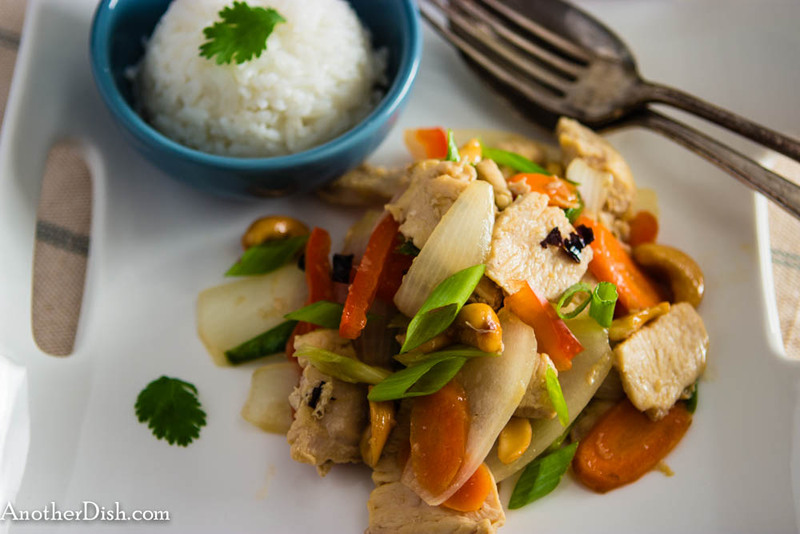 Those who enjoy Thai cuisine, but don’t like too much spice will like this recipe, as it does not have the usual red peppers in it. I hope you’ll try this dish tonight! Whisk together oyster sauce, soy sauce, fish sauce and palm sugar in a small bowl and set aside. Heat oil in a wok over high heat. Add the garlic and stir-fry for 1 minute. Add the pork and stir-fry for 3 minutes. Add the sauce mixture and stir-fry for 5 minutes, or until very thick. Add the 3 sliced green onions and white ground pepper, and stir-fry for 1 more minute. 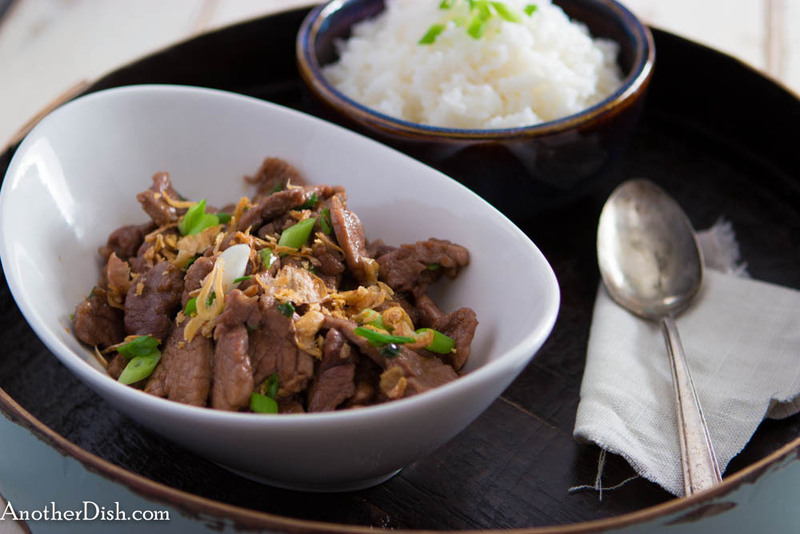 Remove from heat and serve immediately with steamed jasmine rice. Garnish with sliced green onions and fried red onions. This entry was posted in Main Dishes, Pork, Thai and tagged Cooking, Food, Food Photography, Foodie, Jasmine Rice, Recipes, Southeast Asian Food, Stir-Fry, Thai, Thai Food on August 17, 2013 by AnotherDish. 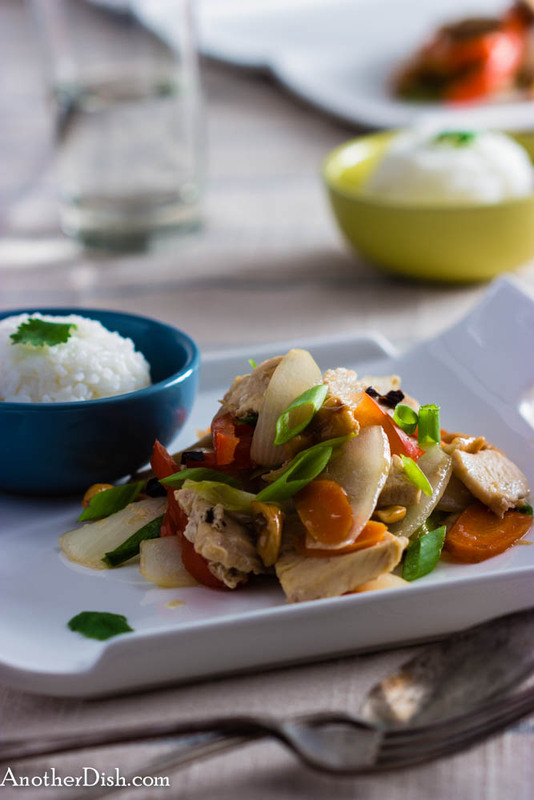 Here’s another stir-fry dish that’s delicious and quick to prepare. You can substitute the raw cashews with unsalted, ready-roasted cashews, but I prefer the wonderfully sweet and nutty flavors they take on when dry-roasting yourself (you can also deep-fry raw cashews in a bit of canola or peanut oil, which is what they do in Thailand). You can also substitute the dried Thai chilies with fresh ones, but I believe this dish is traditionally prepared with dried chilies. 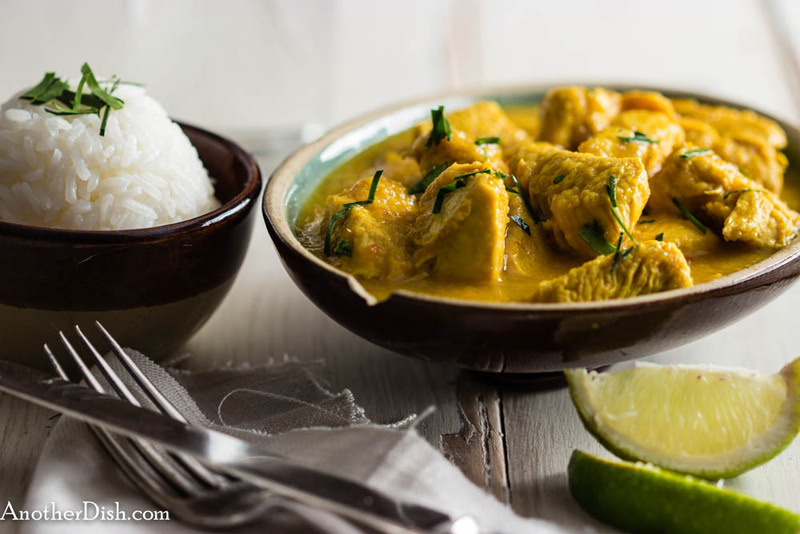 I really like this dish, and I hope you’ll try it too! Heat a small cast-iron or other heavy skillet over medium-high heat. Add the cashews and dry-roast until lightly browned, but not burnt. Remove from skillet and set aside. Whisk together the fish sauce, oyster sauce, stock and sugar in a small bowl, then set aside. Heat the oil in a wok over high heat. Add the chilies and stir-fry for one minute. Remove chilies with a slotted spoon and set aside. Reduce heat to medium-high. Add the garlic and stir-fry for about 30 seconds. Turn heat back up to high and add the chicken, stir-frying for 4 minutes. Add the red bell pepper, carrot, onion and sauce mixture to the chicken. Stir-fry for about 2 minutes. Remove from heat and stir in the cashews, chilies, scallions and white ground pepper. Season to taste with a bit more fish sauce and sugar, if necessary. 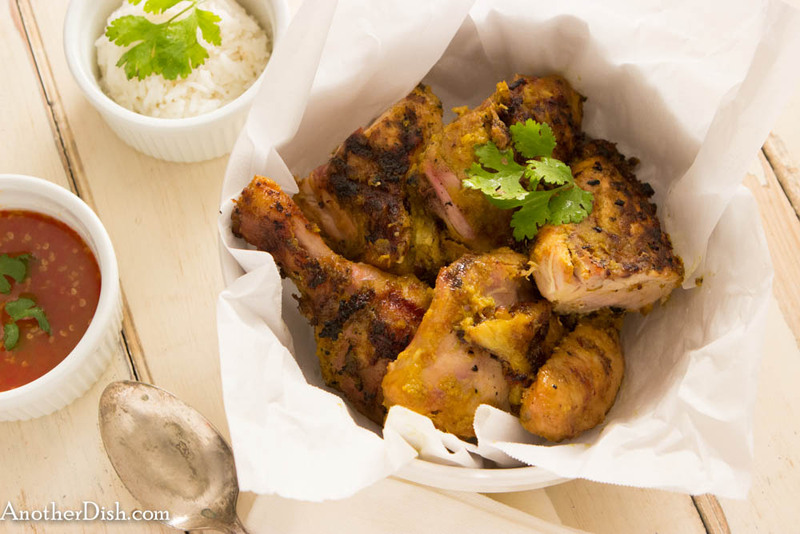 Serve with steamed jasmine rice, and garnish with cilantro leaves. This entry was posted in Chicken, Main Dishes, Thai and tagged Chilies, Cooking, Food, Food Photography, Foodie, Jasmine Rice, Recipes, Southeast Asian Food, Spicy, Thai, Thai Food on July 27, 2013 by AnotherDish. 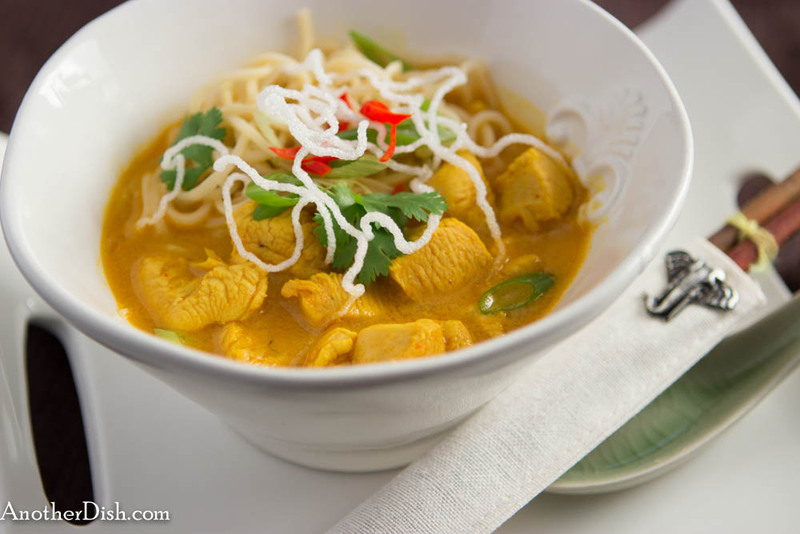 Chiang Mai noodles is one of my all-time favorite Thai dishes (no kidding!). It is the signature dish of Chiang Mai, Thailand, and that is where I tasted it (experienced it!) for the first time. It is said to be of Burmese origin, but it now calls Chiang Mai home. It is served soup-style in a bowl with lots of broth over noodles, together with a bit of meat, such as pork or chicken. 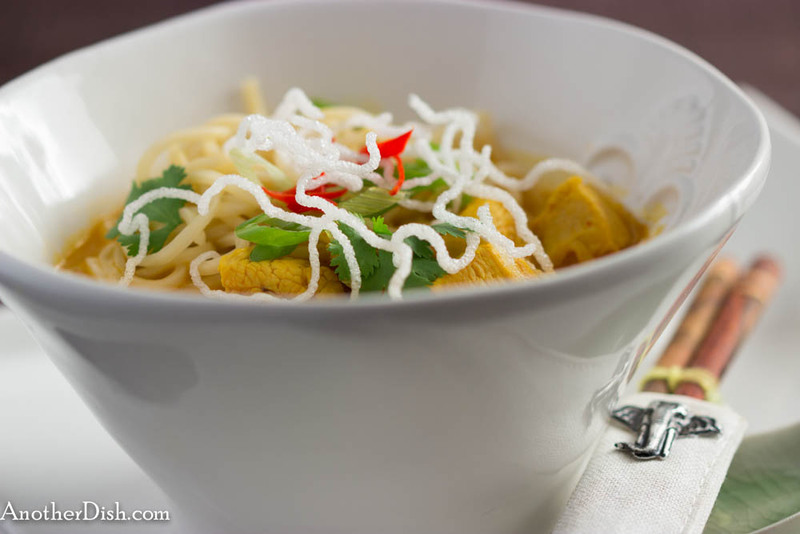 The broth is a fantastic blend of spices, coconut milk and chicken stock, and it is on the hot side. It is typically garnished with green onions, shallots, peppers and a deep-fried nest of noodles (optional). I hope you’ll try it! Heat about 1/3 of coconut milk in a wok or Dutch oven over medium-high heat. As soon as it comes to a boil, add the Thai curry paste and turmeric. Stir constantly for about 1 or 2 minutes, until fragrant. Add chicken and stir fry for another 2 minutes. Add the rest of the coconut milk, chicken stock, fish sauce, dark soy sauce, lime juice, ground pepper and salt to the chicken mixture. Bring back to a boil, stirring constantly. Reduce heat to low and simmer gently, uncovered, for about 7 minutes. Serve in bowls, over portions of the egg noodles. Garnish each serving with spring onions, chopped bird chilies, chopped shallots, cilantro leaves and fried noodle nests (if using). *To make fried noodle nests, divide 6 oz rice vermicelli into 4 “nests.” Heat about an inch of canola oil in a wok over high heat. Test oil when it is hot by dipping one of the noodles into it; oil is ready when noodle puffs up on contact. With tongs, drop one nest into the oil. It will just take a second to fry — remove from the oil as it has puffed up. Place on paper towels to drain. Repeat with the rest of the nests. This entry was posted in Chicken, Main Dishes, Pastas and Grains, Soup, Thai and tagged Chilies, Cooking, Curry, Food, Food Photography, Foodie, Recipes, Southeast Asian Food, Thai, Thai Food on June 23, 2013 by AnotherDish.